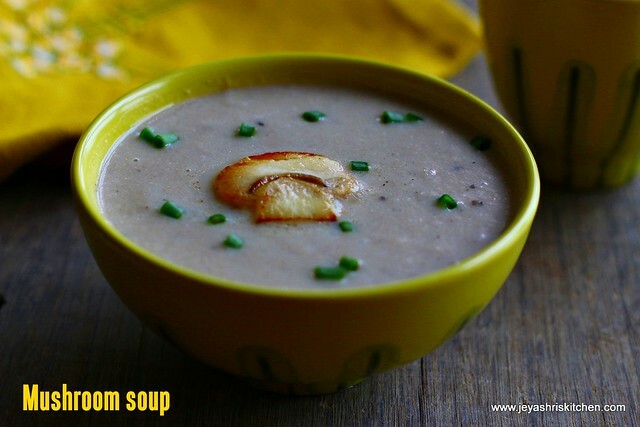 Mushroom Soup | Cream of Mushroom Soup, i have tried few times but somehow didn't get a perfect taste of the soup every time. 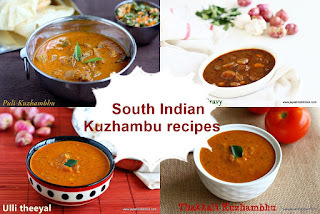 Last month when i was working on Soups and salads assignment for Kungumam Thozi Magazine, i tried this again and got the taste perfect. 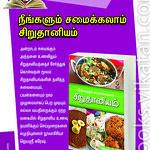 The book got published on Dec.1 and those who in Tamil nadu can get it in shops. 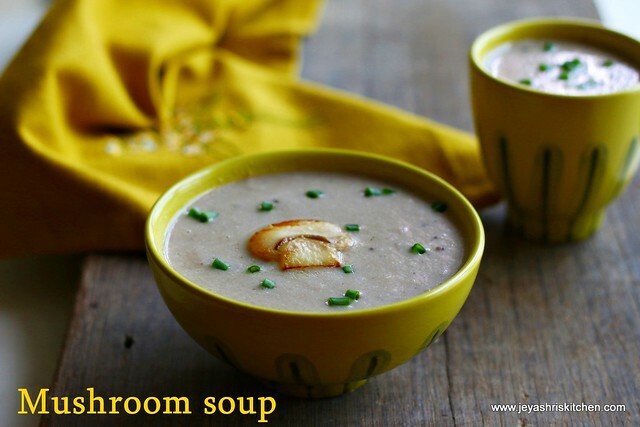 I will be posting some soups and salad recipes here from that book every week. 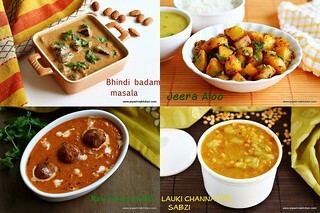 Most of the Indian style soups are a super hit at my home and we often include Soups and Salads in my cooking. 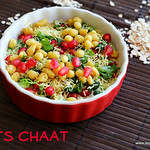 Last 2 months as Suresh is preparing for the Full marathon, i am so particular to include healthy food into his diet. So made a protein packed salad for him everyday along with a soup and a complete balanced diet. Last week he successfully completed his marathon and still now i am working on his diet. Post recovery is also more important. We are travelling to India for vacation and will be back on first week of next month. 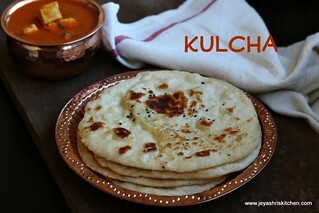 Till then i will be posting recipes but can't be so active in responding mails, and so committed to weekend posts too. 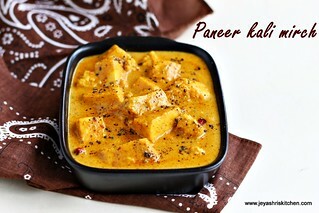 Stay tuned for more interesting recipes. 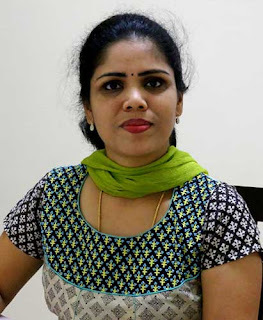 Follow jeyashri's kitchen on Facebook to get updates. Wash the mushrooms nicely and cut them into slices. Roughly chop the onions and peel the skin of the garlic. 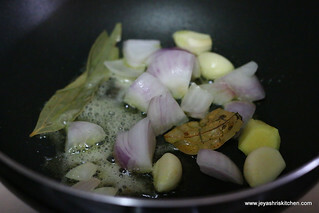 In a non stick pan add butter and add in the bay leaf, garlic,ginger and onions. Saute till golden brown and add in the sliced mushrooms. 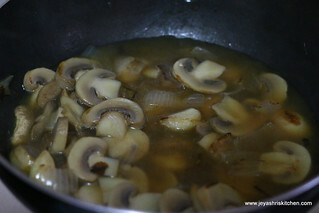 Add 1 and half cup of water to this and cook it till the mushrooms become tender. 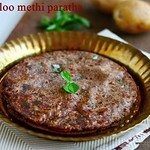 Once done, allow it to cool and keep the water aside and grind the discard the ginger and bay leaf. 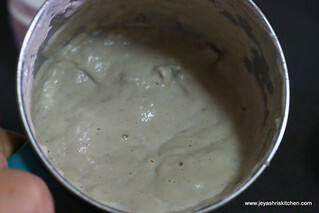 Grind the mushrooms, garlic, onions into a fine paste by adding milk while grinding. You can use raw milk too or use boiled and cooled milk too. 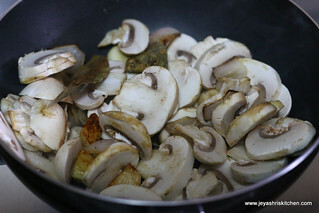 Add this back to the pan and add the water which we used to cook the mushrooms. Add more water reach the right consistency. Bring it to a boil . 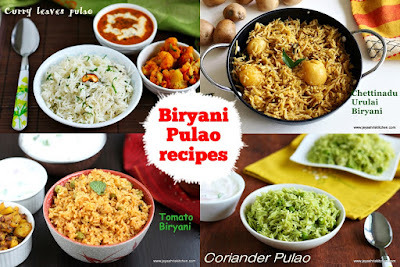 Do not boil for more time .Switch off the flame and add salt and pepper powder. 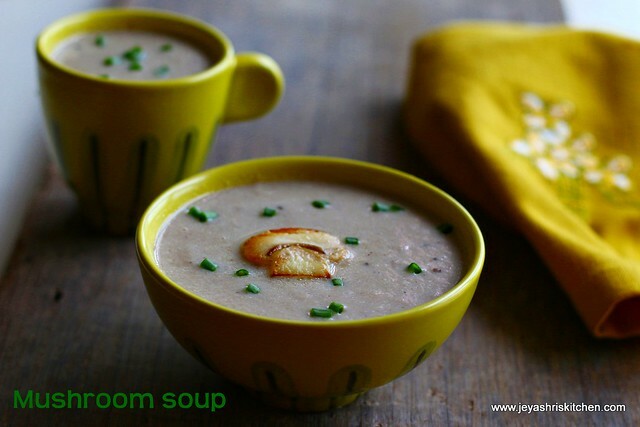 I just garnished the soup with butter sauted mushroom and few spring onion sprigs. If adding fresh cream beat this nicely with the back of the spoon and add it in the last . Do not boil the soup for a long, it may curdle. 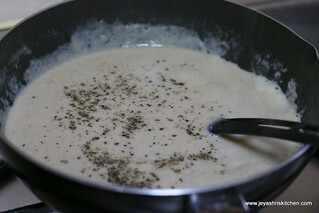 Since we are adding milk ,add salt and pepper in the last. so perfect for the chilly weather here! !